Although this was definitely an arcade game rather than a sim, it is worth a mention because it had a pretty good moving cockpit in the arcades and probably got many people interested in the flight sim genre. Anyway the fact remains that if you tell someone that you're into Flight Simulators there is a pretty good chance they'll say "Oh, yeah, you mean like: Afterburner!" The PC port of this game didn't look as good as the arcade machines but bear in mind that these were the days of 386 25 Mhz processors and 2 MEG RAM! 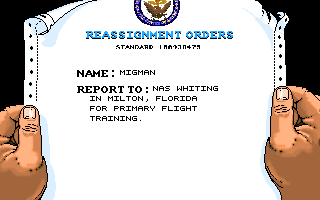 The opening scenes to this 1990 flight sim from Activision are an accurate time capsule! The PC hardware of the day was only capable of displaying a limited number of polygons and colours, and the sound made good use of the latest sound card technology. 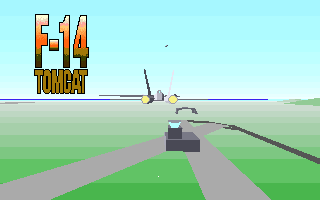 Note that in the game you could also fly in cockpit view. 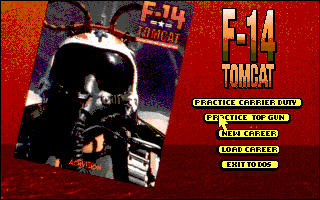 The sim was set in a bombing competition inspired by Gen. Curtis LeMay's training events. It featured an unusual mix of flyable aircraft: F-4 Phantom , F-15E Strike Eagle, F-111 Aardvark, MiG-27 Flogger, RAF and Luftwaffe Tornado and the Saab Viggen.